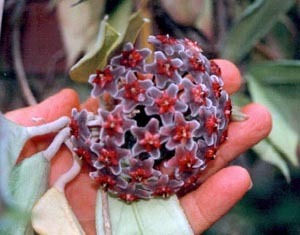 All Hoyas are shipped as 4 node cuttings for $10.00 + shipping. Normal shipping is Postal Service unless otherwise requested. 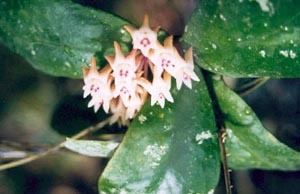 acuta Elongated glossy green leaves with white flowers and red centers. archboldiana - Fragrant large dark green leaves. Bowl shaped rose red flowers. australis 'Tonga' Largest of the australis. Flowers 1" and leaves 8". australis sub sp. 'Sanae' /4" white flowers. 3" fuzzy leaves. bella Small diamond shaped leaves. 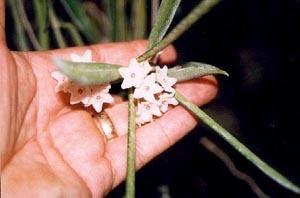 White flowers have a red center. 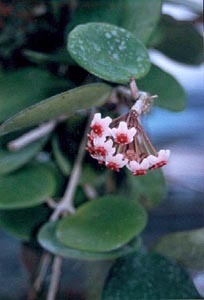 bella paxtonii - Long diamond shaped leaves with white flowers and red centers. campanulata - White with lavender flower 1". Shiny 4" leaves. camphorifolia Pale green elongated leaf with silver veins. Dark pink flowers with red center. carnosa 'Krimson Queen' - Elongiated varietations of green, white and yellow flowers. cinnamomifulia - Large palmate olive green leaves with silver veins. Lime green flowers with deep red center. coronaria - 1" pale cream to white, to green, to pink flowers. crassipes - Red new growth. beautiful flower. cumingiana Yellow & purple flowers. Light green leaves on small bush. 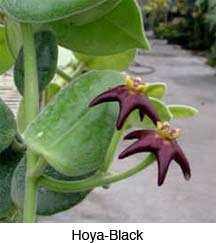 densifolia Elongated glossy green leaves. Yellow flowers with red centers. diptera Oval bright green leaves. Creamy white flowers with dark rose and yellow centers. elliptica - 3/8" white flowers. 4" round, flat dark green leaves. eitapensis - Oval olive green leaves. Light pink flowers with yellow centers. erythrina Glossy lime green leaves with dark green veins. Light pink colored flowers. erythrostemma Rounded olive green veined leaves. White flowers with red center. excavata Rose colored flower. 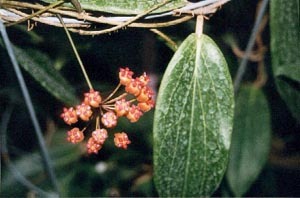 Large, obovate leaves with sharp, down-turned edge. finlaysonii Oval light green leaves with dark green veins. Light pink flowers. flavida - 1/2" Yellow-Salmon flowers. fraterna Long succulent green leaves. Dark pink flowers with red centers. gracilis Elongated green speckled silver leaves. Dark pink rose flowers. 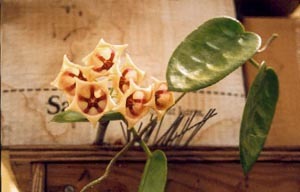 heuschkeliana (Rose) Bell-shaped flower. 2" leaves. imbricata Overlapping leaves. Light yellow white flowers with yellow centers. imperialis (Pink) 3" heavy flowers. Leaves are light green to 12". incrassata Fragrant peach flowers with spotted red centers. Glossy green leaves. incurvula Small pink and red flowers. kerrii Succulent heart shaped green leaves. Light pink flowers with burgundy center. lauterbachii Rose and green 3" flower. Medium size downy leaves. lacunosa Small dark green cupped leaves. Light pink flowers with yellow centers. 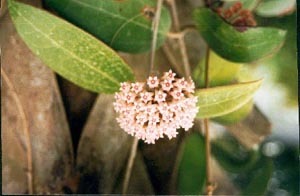 latifolia Buff flowers. Leaves large and veined. leucorhoda Compact heart shaped glossy green leaves. Lgiht yellow flower with red & yellow center. limoniaca Elongated glossy dark green & veined pattern leaves. Light pink flowrs with red centers. littoralis Dark green elongated leaves. Dark pink flowrs with white & red centers. loherii Upright leaves. 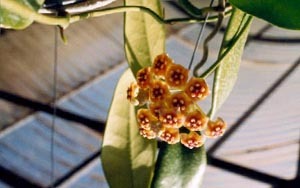 Dark orange and yellow flowers. loyceandrewsiana Buff flowers. 8" purple edged, thick leaves. meliflua Succulent glossy green leaves. Rose colored flowers with red centers. montana Golden yellow fuzzy flowers. Shiny, waxy leaves. 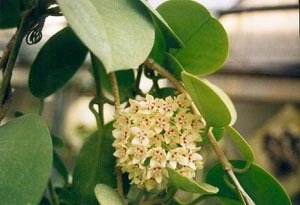 motokesi Fragrant white flowers with red center. Rounded succulent glossy green dark veined leaf. multiflora Elongated green leaves. Light pink & yellow flowers with white & purple center. neoebudica Glossy green veined leaves. Light pink flowers with yellow centers. nummularioides Fragrant pink flowers with red centers. Velvet slighty cupped olive green leaves. obscura Fragrant light pink flowers with yellow centers. Glossy oval veined green leaves. obtusifolia Buff yellow flowers. Thick, fleshy leaves. odorata Fragrant white flowers with yellow centers. Elongated green leaves. parviflora Small white flowers. Narrow leaves. paziae Fragrant white and lavender flowers. Bushy plant. pentaphlebia Fragrant light lavender flowers with yellow centers. Long rounded glossy veined green leaves. picta Small yellow flowers. Small, shiny leaves. plicata Elongated dark green cupped leaves. Light pink flowers with red centers. polystachya Large elongated veined green leaves. Pink flowers with white centers. pottsii - Big green veined leaf. Light pink flowers with dark rose and white centers. pseudolitoralis Succulent broad mottled green leaf. Light pink flowers with dark pink centers. 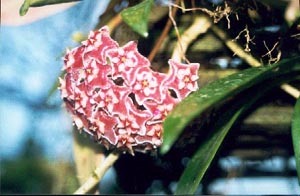 pubicalyx 'Chimera' Mottled glossy leaf with silver, pink or maroon leaves. Deep pink flowers. 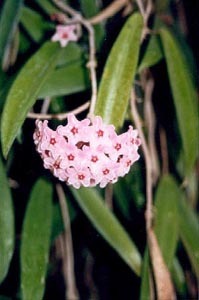 pubicaylx 'Pink Silver' - Patterened silver white on pink green leaf. Dark pink flowers with yellow & red centers. publicalyx 'Bright One' Glossy leaves. Dark pink flowers with white edge. publicalyx 'Fresno Beauty' White speckled glossy green leaves. Dark rose pink flower with white center. retusa White with red corona flower. 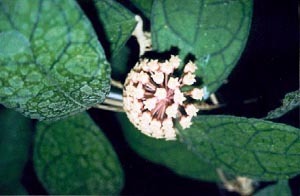 Small narrow boat shaped, hard, ovate leaves. ridgida Pale green and pink flowers. ruscifolia (bilobata) Elongated glossy green leaves. Pink flowers. scortechinii Staw colored flowers. 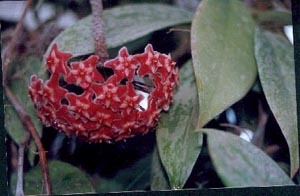 Leaves small with red vein. shepherdii Long green stringbean shaped leaves. Light pink flowers with red and yellow centers. tsangi Velvet green leaves. Pink flowers with dark pink and yellow tipped centers. wayetii Deep red fuzzy flowers. Leaves dark green with deep purple edge.